Maximum Security (photo by Ben Baugh). A perfect break from the gate ended up dictating the terms of the race. Maximum Security kept his undefeated record intact, going gate-to-wire under jockey Luis Saez in the Xpressbet Florida Derby (G1), earning 100 points and punching his ticket for a spot in the field for this year’s Run for the Roses. It was fourth consecutive victory at Gulfstream Park for the Gary and Mary West homebred, and the third time he’s led at every call in the race. However, it’s hard to fathom that this past December, the son New Year’s Day was running for a claiming tag of $16,000. Servis carefully mapped out the colt’s next two races, but was thrilled that he hadn’t been claimed, calling the racing office almost immediately to find out whether the bay charge would still be in his barn. Saturday’s victory was the smallest margin Maximum Security has won by. He broke his maiden by 9 ¾ lengths, following that win with a 6 ½-length score over an off track and, then, locking down the competition with an 18 ¼-length victory. Romero Maragh rode the 3-year-old colt in his first two starts and Irad Ortiz was in the saddle last time. Even though he’s apprentice, it was Maragh who recognized that the bay colt was stakes caliber, said Servis. 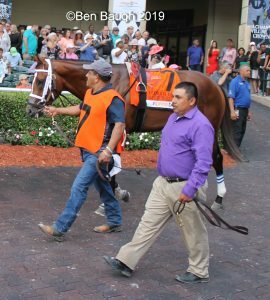 The Xpressbet Florida Derby was Maximum Security’s first time going around two turns, with his last start being contested at seven furlongs. However, Servis was under the impression that the bay colt would be able to get the distance based on his pedigree. Prior to the race, Servis wasn’t too confident, but had great confidence in Saez, who was riding the Maximum Security for the first time. The West’s racing managers will provide their input in regard to the undefeated colt, giving their perspective as the calendar moves closer to the Kentucky Derby. Maximum Security’s versatility made a powerful impression with Saez. Jason Servis would like to join his brother John, in taking an undefeated colt and winning the Run for the Roses, the same his younger sibling did with Smarty Jones in 2004.
Who Do You Like in the Sam F. Davis Stakes?